Lying to myself: something I don’t have much experience with and I haven’t practiced much. And woke rested at the breaking of day. I took call last night and stayed in Wellsford. The clinic proper has two emergency bays, three cubicles next to the nurses’ station, a procedure room, an x-ray room, a good-sized phlebotomy room, a waiting room, six doctor’s offices, a birthing center, and a small administrative area,. The downstairs staff room, 20’x20’ has a microwave, fridge, sink, lockers, and dishwasher; it adjoins a smaller call room with a bed and a non-working TV. The clinic day went well. I took care of patients aged 6 weeks to 85 years. I saw a lot of asthma, impetigo, high blood pressure, high cholesterol, diabetes, accidental trauma, and the ravages of alcohol and tobacco. After not seeing a new case for more than a decade, two patients came in with thoracic outlet syndrome. The bundle of nerves that go to the arm (the brachial plexus) have to pass over the first rib and under the collar-bone on the way out of the chest. If that gap narrows, pinching the structures, the person feels numbness and pain down the arm; intensity of symptoms depend on the position of the body and extremity. Many people have come to me over the years certain that the infection in their nose needed antibiotics, only to have me tell them that they had a cold. A patient, who gave me permission to include more information than I have, came in certain he had a cold, only to have me tell him he had an infection in the nose. I turned down a request for a “sickness benefit” (income from the government while a person is ill); after we discussed the situation, the patient agreed with me. I’m getting more efficient at filling out the paperwork for the truck drivers’ physicals. I finished with the last patient by 8:15, the nursing staff went home and I turned off the lights. Once I asked a doctor who took a horrendous amount of night call how he slept well if he knew his beeper might go off. He said he just told himself he wasn’t on call. I’ve asked around, few doctors manage the vigilance problem that well. But for the first time last night, I believed me when I told myself I wasn’t on call, and when I turned out the light, I slept soundly. In the quiet of the empty building I sat and read a two-day-old paper. An article on page two of the New Zealand Herald used the Maori words korowai, karakia, marae, whangai’ed, and hapu without translation. I understood all of them. The sun is up now, I can hear the people in the clinic tramping around upstairs and I’m ready for a day off. And the form I helped her translate. I met with the Care Initiatives Hospice nurse at a nearby nursing home; as I walked in she called to tell me she’d be twenty minutes late. Sitting by the door were a woman with a clipboard, another woman in white pants and a nursing smock, and a receptionist. Closing my phone, I looked at the woman with the clipboard, and I furrowed my eyebrows. Then we struck up a lively conversation. I gave her my synopsis, and told her I came to care for dying patients. She nodded, and asked about my Christmas. Soon food dominated our conversation. After five minutes or so I turned to the receptionist, and in English announced my name and my purpose and why I would be starting late. I sat down with her and soon realized that, however well I can discuss pathophysiology, pharmacology, and disease states, I have never translated an employment application. The woman, who has above average inherent intelligence but less than a high school education from a third-world country, had been working in the USA for years but had always found help when seeking work. I did the best I could. She had documentation of her ability to work legally. But she had little English. I told her how my wife and daughter had been teaching English as a Second Language at Western Iowa Tech; she was familiar with the institution and wanted to learn English but she was too busy working to get to classes. I expounded the virtues of Rosetta Stone. I had gotten the education and recent work history sections filled out for her when the Deb, the Care Initiatives nurse, walked in out of the cold. I excused myself and we went to round on two patients. Some people approach the end of life with awareness and wisdom, some with fear, some without input of their senses or the ability to understand. Great stories fill every nursing home. One doesn’t traverse decades without experiencing fascinating slices of reality. An hour later, our work finished, we came back past the receptionist. The woman I had helped had left. The Spanish word for show-off is fanfaron. In 1999, in a bid to improve my sleep pattern and thereby help control my chronic pain, I bought Rosetta Stone. Human language is so complex, and we’re so good at learning it, that the brain changes physiology during language acquisition. In the normal course of events, a newborn spends 50% of the time in REM sleep, at a time when the brain is undergoing the biggest intellectual task of its life, learning how to listen and talk. As time goes on, one spends less and less time in REM. We don’t really understand REM sleep but we know that learning becomes very difficult without it; impair your REM and you lose resistance to disease, emotional resilience, and skin elasticity, among others. Percentage of REM increases during language acquisition. I used Rosetta Stone intermittently over the years. As the company updates their programs I keep buying the new version. When I use the program I sleep better and my back hurts less. Chronic pain cannot be controlled in the absence of good, restorative sleep. Everyone knows that pain level five becomes a six or a seven after unrestorative sleep, or a three with a good night’s sleep. People who don’t hurt at all will start to ache if you don’t let them sleep; thus fibromyalgia depends on sleep deprivation. People with rheumatoid arthritis (RA) sleep poorly and they hurt. A recent study showed that sleeping poorly predicts pain during the day more than pain during the day predicts sleeping poorly. I never prescribed sleeping pills before zolpidem (Ambien) came on the market. We now have four good prescription drugs to induce restorative sleep: Sonata, Ambien, Lunesta, and Rozerem. Each has a different place, all of them will help a person sleep and help them rest. Rozerem is the best at putting a person to sleep, but it won’t keep that person asleep. Thus it’s good for new mothers or others who have trouble switching off their minds so that they can fall asleep. Sonata is a good four-hour sleeper, it’s for those who have to make the most of the few hours they’ve allotted to be in bed. As such, except for those people who get six or seven hours out of it, it performs a function but doesn’t solve the problem. Ambien or its generic equivalent zolpidem will put a person to sleep and most will stay asleep for about eight hours (I have had patients who got twelve hours and a few who only got four). I reserve Lunesta for those alcoholics who didn’t respond to my pleas to quit drinking nor to my prescriptions for zolpidem. But mostly I prescribe the non-pharmacologic approaches to sleep management: good sleep hygiene (Google “rage, hunger, lust, and sleep”), and study a language. A few months ago a major pork processing plant in Sioux City, John Morrell, closed. The outdated physical building lost efficiency compared to new buildings; we all knew it was only a matter of time and wondered that it took so long. Sioux City has depended on meatpacking for more than a hundred years; the business model has changed a great deal in that time, but the nature of the work hasn’t changed much. The labor-intensive activity of turning a hog into pork chops, ham, bacon, and sausage is still cold, dirty, and boring. You can earn a living wage without English. It has been an attractive occupation for some in the deaf community. Our town has depended on waves of emigrants since the 1880’s. Germans, Swedes, Norwegians, Greeks, Lithuanians, Syrians, southeast Asians, Hispanics and most recently Somalis came to the slaughterhouses to work. They faced discrimination and prejudice, and the rhetoric has changed very little since the beginning. In fact, Spanish is an endangered language here. The first child is bilingual, and teaches the younger siblings English. Frequently the youngest child can’t speak Spanish and can’t talk with the parents. How I learned to speak Spanish, and why I never stopped. When people ask me why I speak Spanish, I give the short, simple answer: I picked it up in middle school and I’ve never put it down. Like all simple answers to complex questions, it is neither wholly true nor wholly untrue. I remember the April morning in ninth grade Mr. Esbenshade walked into Spanish class and said, “These are the last words of English you will hear in my class.” He dumped a bag of Cuisenaire rods (small wooden blocks, color coded by length) on the table, held one up and said, “Regleta.” He motioned for us to repeat the word, made sure every one of us could say it, and moved right on to the verb tener, meaning to have. At the end of the class I was thinking in Spanish, but I was not thinking very much or very deep. High emotions make for high learning; for example, everyone remembers where they were and what they were doing when they heard about 9/11. Adolescence is a time of high emotions; my emotions at that time were even higher because very bad things were happening in my family of origin. The language took root in my brain and has not left since. I think Mr. Esbenshade changed teaching strategies out of frustration. My group had failed to learn first year Spanish in seventh and eighth grades. Seventh grade Spanish was El Espanol al Dia. We didn’t get past Chapter Nine and we retained none of it over the summer. In eighth grade they tried putting us in the brand-new Language Lab and giving us ALM (Audio-Lingual Method) Spanish. Evidently some thought the theory good at the time, but I doubt that constant repetition in the absence of visual reinforcement will induce anything but boredom in most normal middle-schoolers. Nonetheless my children and wife will sometimes blurt ‘Albondigas! No te dije?’ (Meatballs! Didn’t I tell you?) because I retained that phrase–it sounded like cursing. After high-school I took a year of Spanish literature in college, but I haven’t studied Spanish on a formal basis since 1969. I worked in the minimum wage sector for a long time. Language barriers being what they are, if I wanted an intelligent conversation with my co-workers during those years I had to speak Spanish. I learned from mistakes and imitation. There really is no substitute for practice. The three years I worked with the Navajo I mostly worked on my Navajo language (Dine bizaad); I still spoke Spanish with some of the older men who had learned the language to carry on commerce with the local Hispanics. I came to private practice just before the tsunami of Hispanic immigration to Sioux City’s meat packing plants. In a few years, half my practice was conducted in Spanish. My office nurse learned basic Spanish. We hired a series of Spanish-speaking receptionists who were very good workers. Two decades ago, on a regular basis I could see relief on a patient’s face when I walked in speaking Spanish. I attained fluency many years ago; now I’m articulate in Spanish to the point of doing comedy. What language did they really speak? My Spanish unpracticed was weak. This morning we heard a couple at a gas station not speaking English. Both were dark in complexion; the woman had curly hair and a Mediterranean nose; the man was tall and slim, clean-shaven with very short hair. We saw them again at breakfast. We kept trying to catch enough of their conversation to get a fix on the language. I didn’t hear the gutturals of a Semitic language or the nasalized vowels of a Slavic language. It certainly wasn’t Italian or Greek. They spoke quietly, clearly having a good time and cracking jokes. Every time one of them spoke loudly enough and clearly enough, background noise spoiled the reception. Now Alaska Highway 3 only has two destinations for rental cars: Anchorage or Fairbanks; my question was a fairly obvious bet. Yes, they were going to Fairbanks. I’ve just been in Barrow for eight weeks, I said. They asked, Barrow? I pointed out the village at the top of their map. They were impressed. I explained that the only way to get there is airplane or barge. Then I got to ask the critical question: Where are you from? A lot of visibly ethnic people in this country object to that question, as many Americans will assume that Asians aren’t really from (for example) South Dakota. Tourists aren’t so sensitive. They were from Spain. I immediately opened up with my Spanish. The story of my acquisition of Spanish fluency runs long; the short version is that I learned in ninth grade and the only time I quit practicing was the time I spent in Navajoland. For the better part of twenty years, half my working day was in Spanish. When I left Sioux City I spoke much better Spanish than when I was just fluent. This morning, after ten weeks in Alaska, my tongue felt clumsy, and I didn’t change my accent to match theirs. Then the couple revealed that they’d been speaking not Spanish but Catalan, a Romance language as closely related to Spanish as Portuguese; Spanish was their second language. She works in a non-governmental, nonprofit organization; he does information tech for a hospital. They flew from Frankfort nonstop to Anchorage. We drove on to Fairbanks, and our GPS unit, evidently confused by something, kept telling us to take a sharp left into the boreal forest. We turned her off. En route to Fairbanks we stopped at an overlook and saw fires burning along the Tanana river. 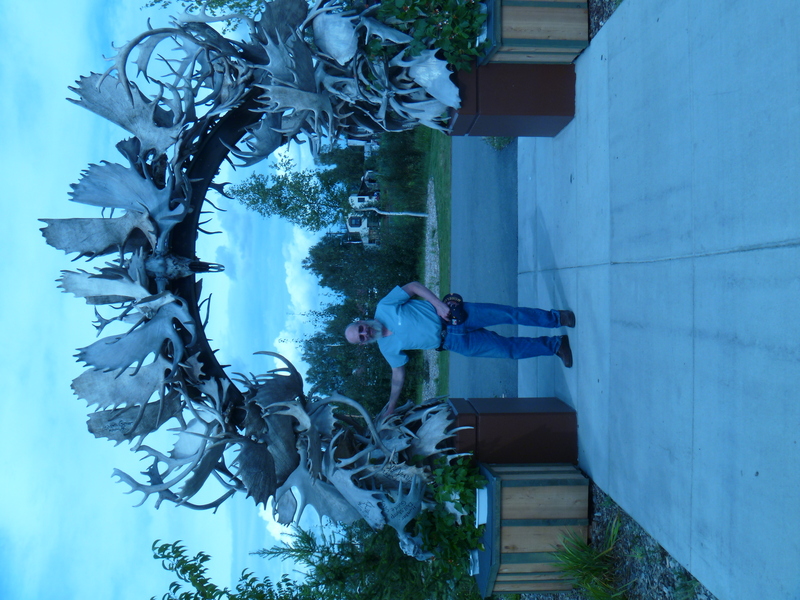 In Fairbanks proper, Bill, a Native we met, guided us to the visitors’ center, a well-built facility near downtown. We got city maps, directions to our bed and breakfast, and toured the exhibits. I bought a zipper pull made of walrus ivory from a Native artisan. The prosaic part of the journey came at the Laundromat, followed by a movie. We haven’t been to the movies in three months. We enjoyed the comedy and being together. I replaced a cast on a young man’s ankle, and he gave me permission to publish this information. Preparing for the Nalukataaq, or blanket toss, his whaling crew was getting the blanket ready. Remember that at a blanket toss, they don’t really use a blanket. It looks like a blanket till you get a few meters away, then you realize the trampoline sized object is sewn together from two layers of seal skins. The skins came from one of the successful whaling boats, constructed by hand here in Barrow, and were part of some bearded seals hunted nearby. Stout rope handles, ten to a side, are sewn between the skins. Long ropes running from corner to corner are sewn in as well; the whole “blanket” is supported by those ropes which are anchored into the permafrost, tightened with block-and-tackle, and held eight feet off the ground by timbers. To actually “toss” someone, forty strong men gather around the “blanket” and synchronously apply more tension to the baseline tension. When the rhythm works (which is most of the time) the results are impressive, people sail thirty feet into the air. My patient, wearing clunky rubber boots, climbed onto the blanket. Thinking the crew was ready, he started to jump. As only a few were tossing, when he went up for a back flip the timing was off and a fractured ankle was the result. As I replaced his cast, I recounted my first-hand experience with not one but two broken ankles when I was sixteen. I had run too far for too long and stress fractures of the outside ankle bone (lateral malleolus)were the result. I didn’t follow the orthopedist’s instructions about cast care. In the days before fiberglass casting material I destroyed three casts before my doc gave up and gave me ankle supports, forbidding me to run till cleared. I talked with another of my patients, suffering from a good deal of self-imposed stress, about the joys of delegation and not being the boss; I was given permission to include a good deal more information than I will include here. I observed that most outsiders who come to Barrow are not seeking a fast-paced, wall-to-wall lifestyle, and that we change more about what we do to ourselves than about the things that are done to us. A lot of mental illness outside of stress and harsh life experiences afflicts the people here, with no regard to ethnic group. Schizophrenics are more integrated into family and society here than back home where they are marginalized and isolated. Bipolar disease (formerly known as manic-depression) occurs throughout the world and does not spare Barrow. I’m using my Inupiak language skills and I’m getting better. I can say Hello, How are you? I’m fine, and My name is Dr. Gordon. I can also say the Inupiak word for seal oil (think of it as seal schmaltz), bearded seal, whale, poop, goose, walrus, bow (as in archery), and Good morning. The sea ice broke up, the eczema responded to propranolol, the young respect the elders. And don’t use possessives when you talk about whales. Enjoying respect from the young. I have permission to give the following information. A teenaged patient with eczema, severe to the point of disability, came in a couple of weeks ago. For reasons clear to me only at the time I did a thyroid test and his TSH was slightly low, indicating an overactive thyroid (the current primary thyroid test, the TSH or thyroid stimulating hormone, measures the brain’s demand for thyroid hormone; low levels indicate excessive circulating thyroid hormone). A week or so ago I prescribed propranolol. The eczema is markedly better today; the patient looks happier and is sleeping better. Next time I have a patient with poorly controlled eczema, I hope I remember the patient who had been to multiple dermatologists for years and got better with propranolol. The patient was happy, the relative was happy; I could see things had turned out well, and I came away with job satisfaction. The young people treat me with great respect. I commented on that to a knot of early twenty somethings. They smiled at me with grandchild-like love and talked about how reverence for elders is part of the culture. I got to talk to two people with critically low vitamin D levels, in the single digits, today. Both have diffuse bone pain. I explained how calcium doesn’t get absorbed or used properly without vitamin D, and in compensation the calcium in the bones gets mobilized. Which keeps the circulating calcium up at the expense of skeletal strength. Alas, one of the two uses narcotics recreationally; I hold confidence that I’ll make the bones better but I harbor no illusions that the narcotics seeking behavior will stop. I hope I’m wrong. The sea ice broke up in the early hours today. This morning, working on the elliptical, I watched white ice flows on blue water floating slowly south, pushed by the winds. We’ve seen the first Nalukataaq injuries. I’m a person with enough sense to say that blanket tossing looks like fun for the young but not for me. Not everyone agrees with me. My Inupiak language acquisition program is progressing. I’m in the stage of echolalia, where I can repeat short sentences but I don’t know what they mean. I was able to say “Good morning. How are you? I’m fine. My name is Dr. Gordon.” But my head is not in the language and the language has not taken root in my head. I am, however, working on it. Too slow and you’ll suffer the pangs. The weather cooled today, thawing stopped and everything froze. Clouds completely cover the sky, visibility is about a half mile. White dominates the view from my apartment window. About one hundred yards from the hospital housing a road runs next to a six-foot berm; two hundred yards past that is the Arctic Ocean. The berm was put up to keep the waves out-of-town when the storms get bad. Orientation took up most of yesterday. Employee Safety manual was pretty routine. The most common on the job accidents here are slip-and-fall on the ice. I also have to be mindful of the polar bears that occasionally come into town. The ethnic diversity of the hospital staff, the patient population, and the doctors startles me. I have encountered speakers of French, English, Inupiat, Tagalog, Thai, two Malayo-Polynesian languages, Breton, and Spanish. I was too polite to ask the first language of others from Pakistan, India, and Africa. Physician morale is very high. Every weekday at 8:00 AM the doctors meet to discuss cases. The interchange of information, the case discussion that nourishes every physician’s growth is part of the daily routine. Of the permanent physicians, the shortest tenure is five years and the longest is 12. I spoke with one of the locum tenens doctors yesterday who loves Barrow. We talked about the relief of not being an owner, or boss, and about how much more we love healing than managing medical care. Most Natives are Inuit and do not like to be called Eskimo. For many, Inupiak is the first language of the household. I intend to learn at least enough Inupiak (Inuit language) to be polite. My first word today, pahalayikpiin, is a greeting. The complexity of Inupiak will be beyond my grasp in the time available. I’ll do my best and make a lot of mistakes. I worked the walk-in clinic this afternoon. I enjoy pediatrics, and today most of my patients were under the age of 12. Like Sioux City, much of the adult medicine I saw today had to do with consequences of the legal addictive drugs: nicotine, caffeine, and alcohol. Infectious disease dominates the clinical problems of the younger patients. The hospital is making the painful transition from paper medical records to the electronic medical record. The medical practice formerly known as mine went through the same process but we compressed it and finished in less than six months. I have heard people express feelings that things are moving too fast and too slow. The outpatient area moves patients through in a time-efficient fashion. Little floorspace wastes few steps. The amount of work that got done amazes me; there is much to be said for close quarters and against spaciousness. You are currently browsing the archives for the Language acquisition category.